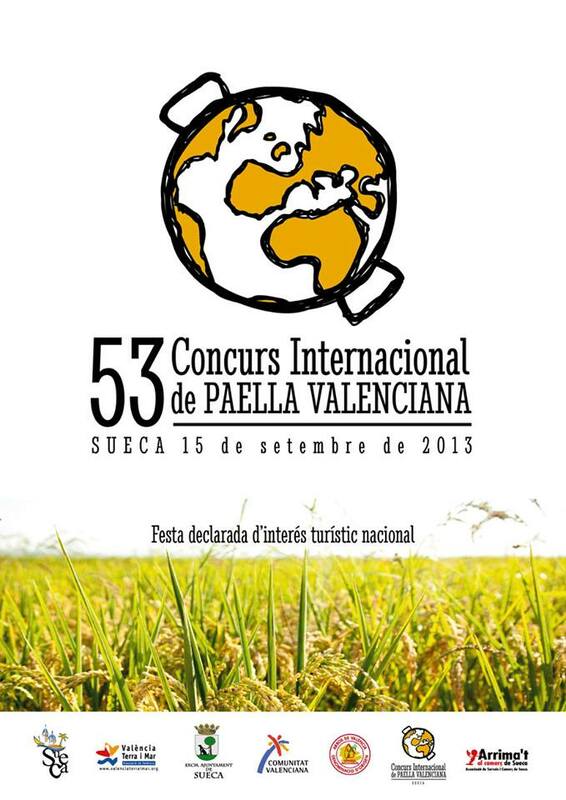 54th Concurs Internacional de Paella Valencia…Cooks from Around the World Battle it Out in Sueca! 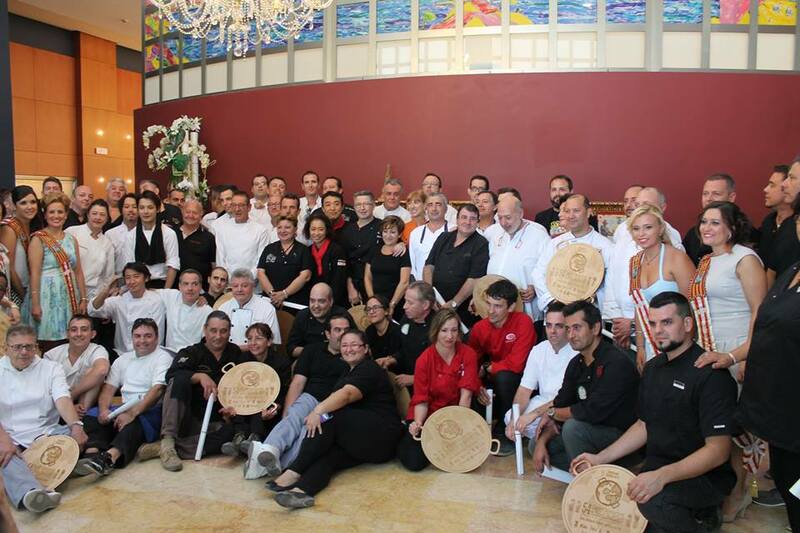 Sunday 14 September 2014, the big day arrives and 35 chefs and their assistants gather in Sueca for the final of a truly world-wide contest to begin! For the record it was another very hot day in Valencia´s capital of Paella, Sueca being at the heart of the Provinces´rice growing area. But this year this is not the first time the contestants, or at least some of them , have cooked a paella in this competition this year. Sueca may be the epicentre of Valencian Paella, it is certainly home to the annual competition to decide who cooks the best one, but such is the interest now, worldwide , in this fiercely argued over dish that Sueca has sought to truly Internationalise the competition. In the past France, Germany, New Zealand and even the US and the UK have provided entrants, invited by the organising committee to provide competitors and spice up the competition. It was even won by a US team ( although they were of course Valencian chefs working there) a couple of years back. So this year, Jesus Melero Martinez, Coordinator of the concurs, together with the councillor from the local town hall, Teresa Ribes and publicity gurus and brothers Miguel and Vicente Sanfeliu ( Socarrat Studios) concocted a plan to franchise out the foreign bit and hold what were to become Semi-Finals in Miami, Shanghai, Tokyo, Australia and London. 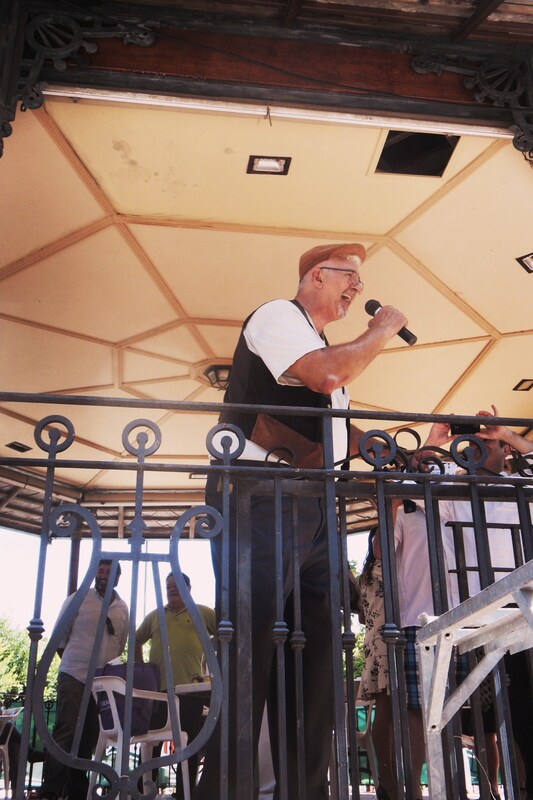 The winners and first and second runners-up would be invited to participate in the final in Sueca. 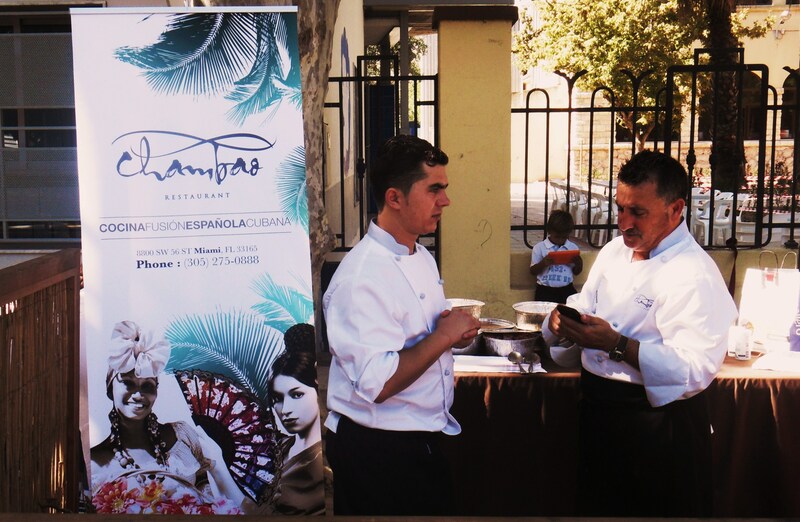 Here they would join the restaurants from France, Spain and Germany who would be selected traditionally from the many who entered the competition invitation. The competition remains open to professional restaurants only ( there are a host of competitions for amateurs) as has always been the case. In this, its first year the franchise only really got off the ground ( but to spectacular success) in Manly ( Australia) Shanghai ( China) and Tokyo Japan). Despite the huge popularity of Paella in the United Kingdom ( sadly more often than not cooked with inappropriate ingredients such as chorizo and peas….for which Gordon Ramsey, Delia Smith and Jamie Oliver have a lot to answer) in the end the UK´s only representative was Restaurant LA Room with chefs Xavi Meroño and Javi Vicente Rejas ( Barcelona and Valencia respectively). Cleverly they had worked the `Keep Calm´ theme to their advantage and sold t-shirts to their supporters. VÍ vid with LA Room London. The first of the heats covered Oceania ( Australia, New Zealand and Colombia) and was held in Manly. Jesus and Miguel flew out and the former , ( owner of RiRa Restaurant in Sueca- home to an array of traditional Valencian Rice Dishes) gave a masterclass on the eve of the competition, cooking authentic Valencian Paella. No little effort went into getting this correct, even the original paella pans by Garcima, local rice, olive oil, pimenton, saffron and the recipe were despatched on the plane together with gas manifolds! Eleven Australian restaurants and one each from Colombia and New Zealand took part. 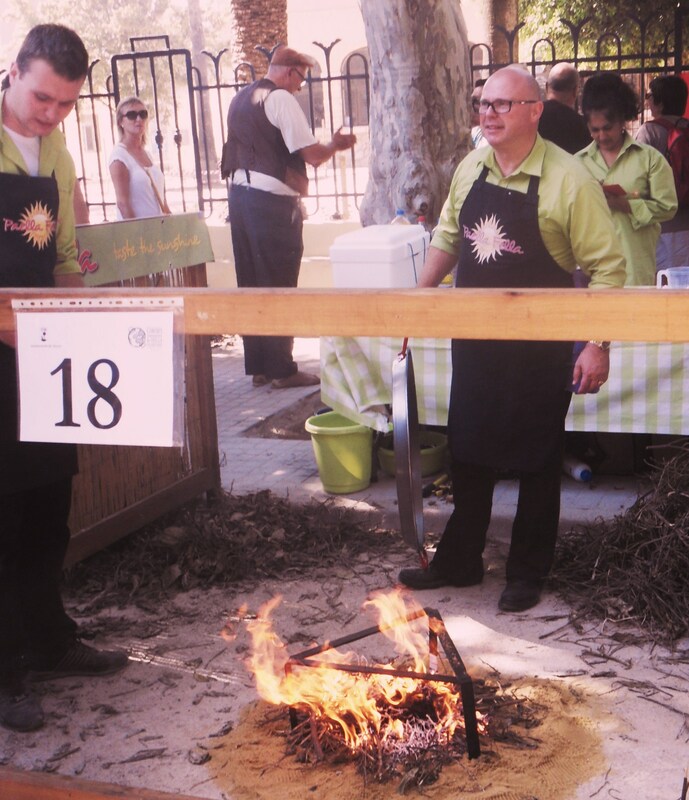 New Zealander Edrick Corban-Banks who has cooked in Sueca at least twice before was co-organiser and major financial sponsor of the heat and joined the judging panel this year! The winner was Hassan M ´Souli of Out of Africa restaurant, a Marroqui by birth. Faillino Lattento of Simply Spanish was second and Kif Weber and Scott Hefferman of Sah Modern Mediterranean were third and all invited to Sueca for the final. 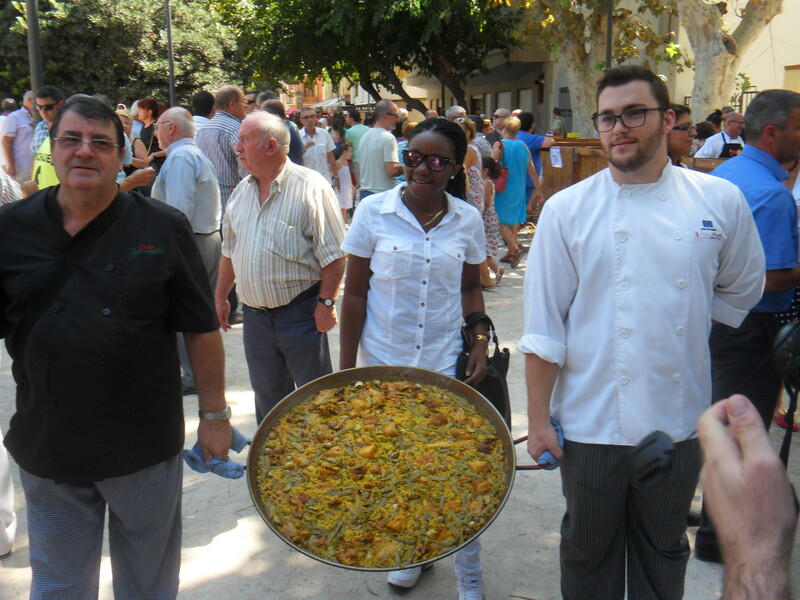 More than 1000 portions of Paella were eaten on the day! At the end of May the roadshow moved to Shanghai in China and in this heat the winner was Oscar Leon of La Pedrera de Shangai…. 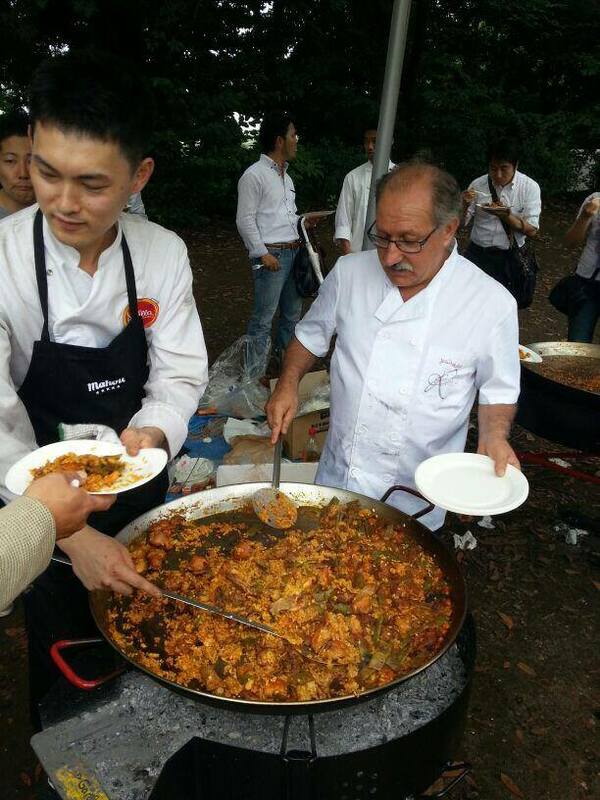 The last of the true semi-finals was a huge success in Tokyo, ( Japan has also had representatives at Sueca in the past – has a paella cooking Society and the Consul General to Spain is a judge!) 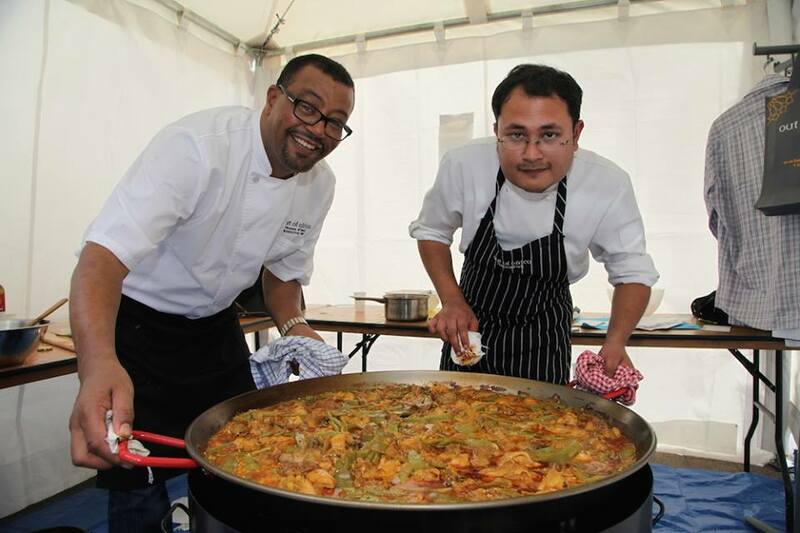 6000 portions of paella were produced and Bar Espana ( Sapporo) , El Lagar and El Soleado were the runners-up from a competition with 16 participating restaurants! For the record these contestants were joined by Flavours of Spain from Sydney, La Paella Iberica and Saint George from France and the La Loca Tapas bar from Bonn in Germany, the rest being Spain based, the majority local to Valencia. Tradition runs true here in Sueca. The contestants, by now full of trepidation or with adrenalin coursing through their veins gather early to collect their ingredients, prepare them and marvel at the equipment provided for the chefs. ( Paella pan, stand and a heap of dried orange wood!) The more relaxed eat a late breakfast! Cooking commences, the deadline approaches and the atmosphere lifts. The smoke from 35 fires swirls around the park opposite the train station, stinging the eyes of chefs and the growing public mass. Beer flows from the free bar ( or coca cola if you must!) and the amateur observers are not slow in coming forward with advice to the chefs…`heat is too high, you will burn the pan´…`no, no, the vegetables go in later´etc etc….not that many of them are fluent in Japanese ( or English come to think of it!!). Paella Heading to the Judges! Suddenly cooking is over, the politicians have completed their tour of the boxes where the cooking takes place and the last photographs are taken. 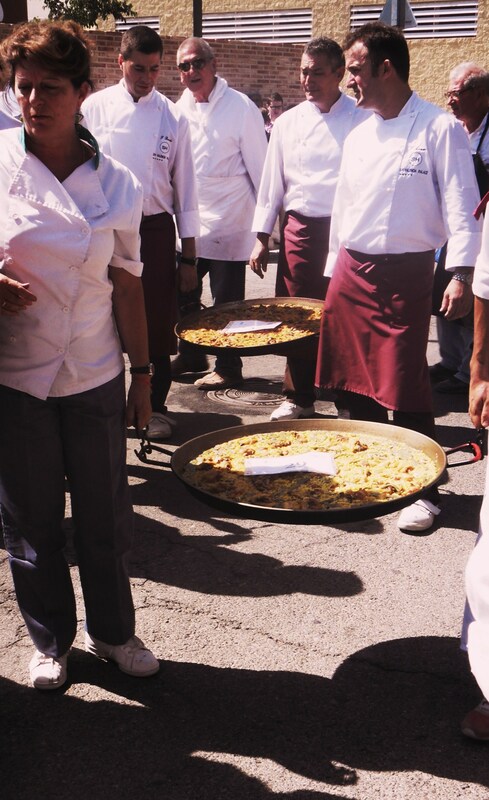 Then the paellas process up the hill to the banqueting hall to be judged…anyone who is late is disqualified!!! This is as much as the public get to see. The rest of the occasion is strictly for the judges, the press and local dignitaries, sponsors and family members. 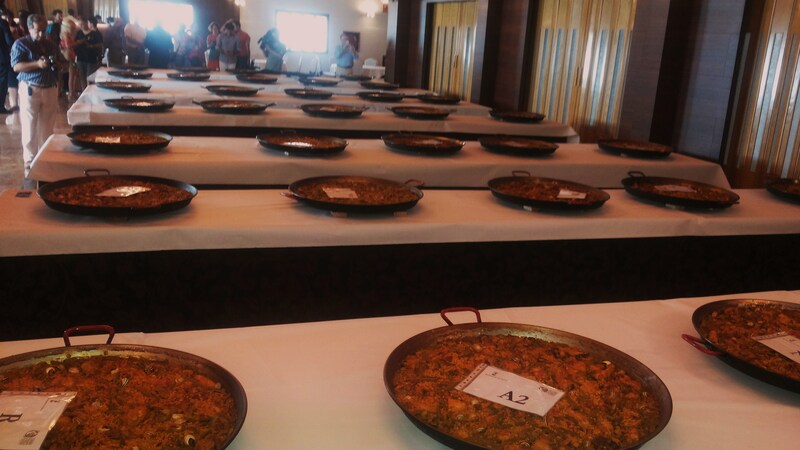 As a member of the third estate, ( communication media) Ví vid ( with Ricardo´s Blog) were able to access the judging room, inspect all the eligible paellas and take more photographs before the serious part of the day commenced. 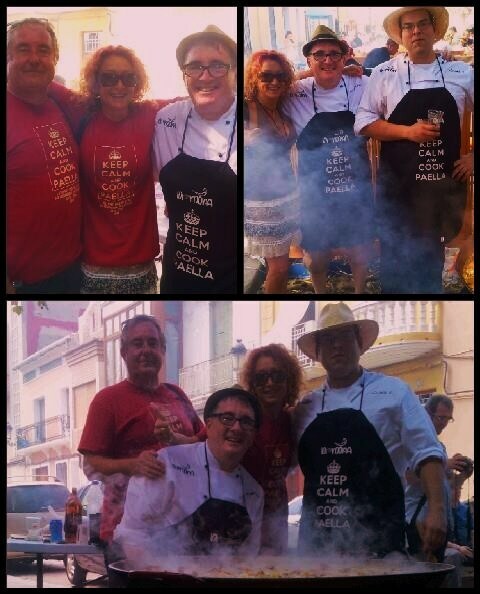 The judges were left to try every paella and come to their verdict…and the rest of us repaired next door. Lunch follows with a long presentation first to the regional winners, restaurants who have been honoured by selection to participate for the first time, honoured guests and the organisers who flew round the world to make it all possible. Three special prizes, Paellers d´honor are also awarded to those who have contributed selflessly to the world od Spanish gastronomy…a journalist, Director of the local Parador and a chef from the Basque country. 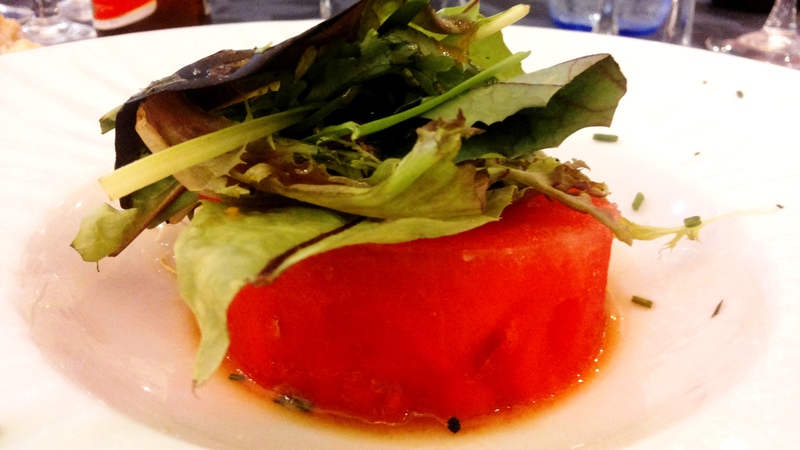 Lunch was starter of Water melon with a vinaigrette of blood orange with salad leaves; the entrantes were a coca with tomato, tuna and anchovy and meatballs cooked in a tomato sauce. A sorbet of mojito with rum cleansed the palate before the Main Course…Paella Valencia. 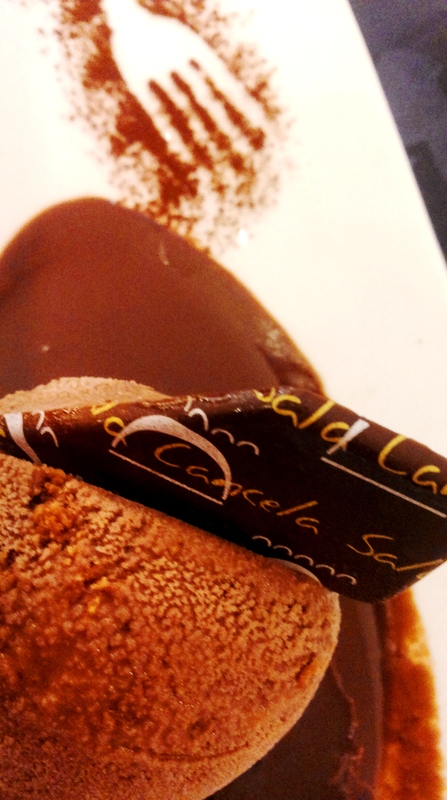 Then the Restaurants trademark dessert, coffee ice-cream on a chocolate brownie with chocolate sauce was presented. Wines were provided by this years sponsors Bocopa and the Cava and Federica Licor ( orange ) were provided by Pago de Tharsys. Chocolate Ice Cream and Brownie! Then the long-awaited prize giving took place. Third Prize went to Hotel Hospes Palau de la Mar, Valencia. Second prize was awarded to Restaurante Casa Pepe Sanchis, Cordova. Restaurant Miguel y Juani from nearby L´Alcudia. Another exciting and enjoyable day, one with an atmosphere you have to be there to understand was over. With it a considerable amount more effort than usual had been expended to make it more truly International than before. We have no doubt that this will continue to grow and maybe next year we will see Restaurants from England and the rest of the world whose names are a little less Spanish in origin….whatever, Paella Valencia de Sueca will be the winner!!!! 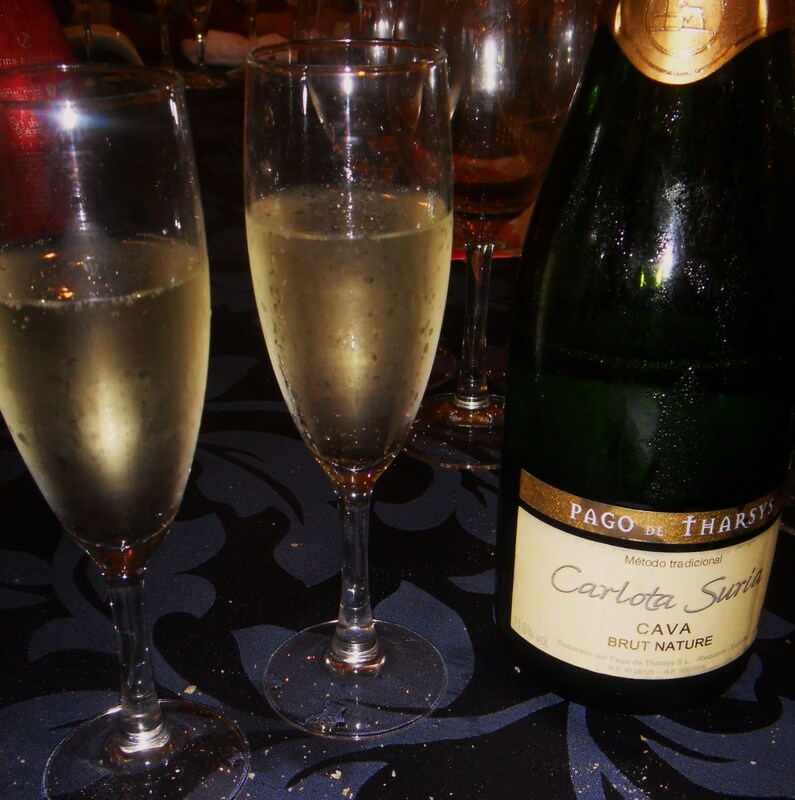 Carlota Suria, Cava from Pago de Tharsys. 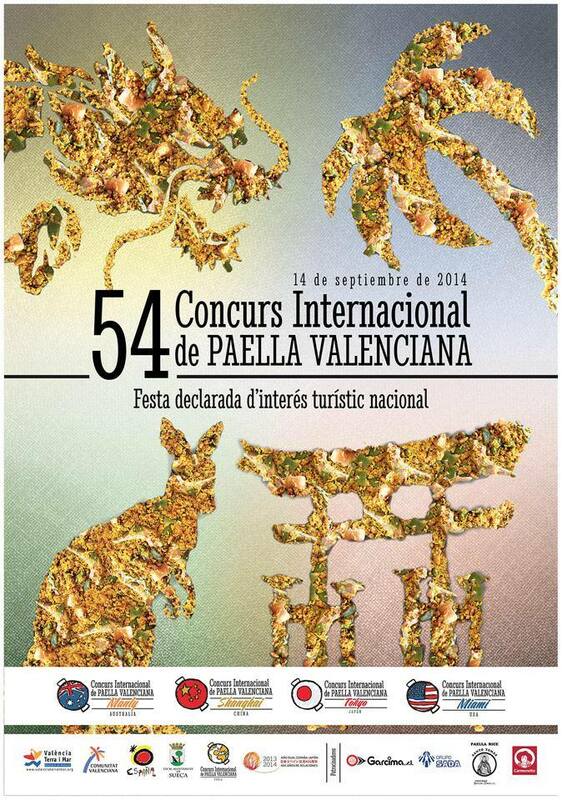 Sueca 2013, The Best Paella Valenciana in the World and a Truly International Competetion! 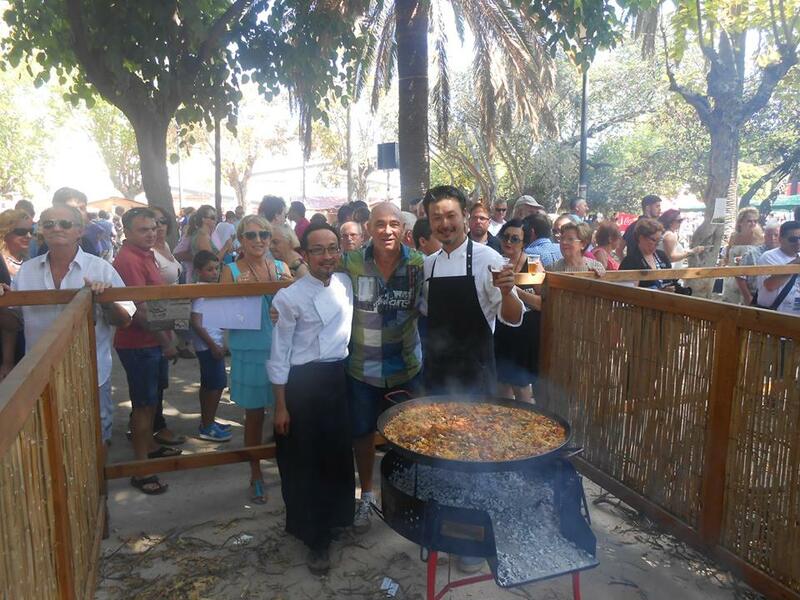 The 53rd International Competition for professional chefs and restaurants to cook the best Paella Valenciana in the world was held on Sunday last in Sueca. 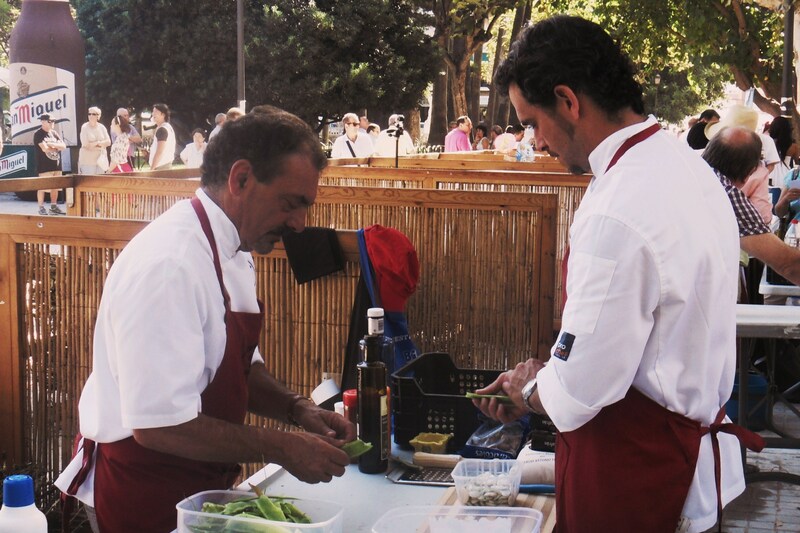 Thirty invited restaurants from the 150 applicants took part on a hot day in the park by the station in the centre of town. The most notable element this year was the higher proportion of International contestants taking part! Casa Paella Ltd , Nelson ,New Zealand. Restaurant La Chaumiere, Font-Romeu, France. Restaurant Ginza Espero II , Tokio, Japan. Paella Fella, West Sussex, England. Restaurant Español Picasso, Hamburg, Germany. So with all these foreigners taking part there was a fair chance that the Best Valencian Paella in the world may actually be cooked not by someone from Valencia! 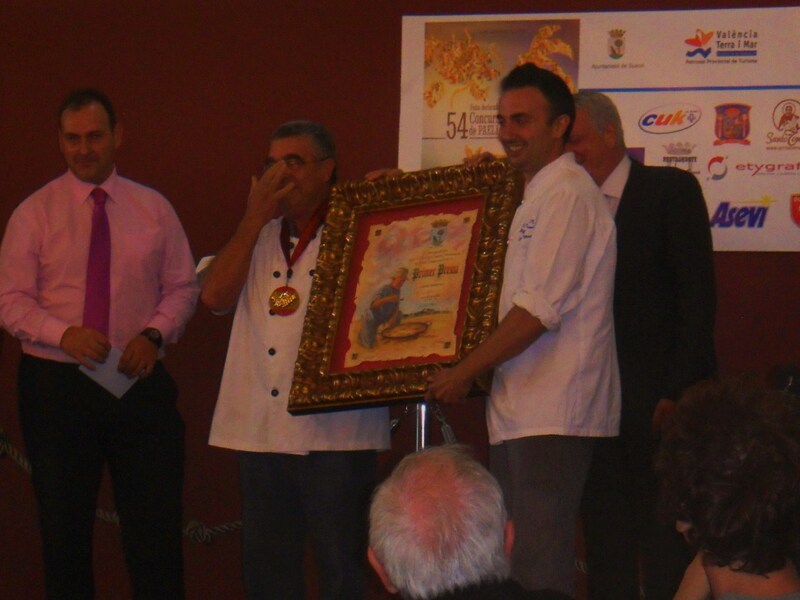 Last years American winner it should be remembered didn´t really count because the chefs were exiled Valencians! Salt and water from Sueca. 1.5kg, Valencian rice from Sueca. 1 Litre Olive Oil, DO Valencia. 1.5kg of the three beans, garrofón, tavella and ferradura. Saffron in strands and powder form. Edrick Corban-Banks from New Zealand had cooked last year as well and had come fifth. He was well into his preparation when I caught up with him and was hopeful of finishing further up the order. 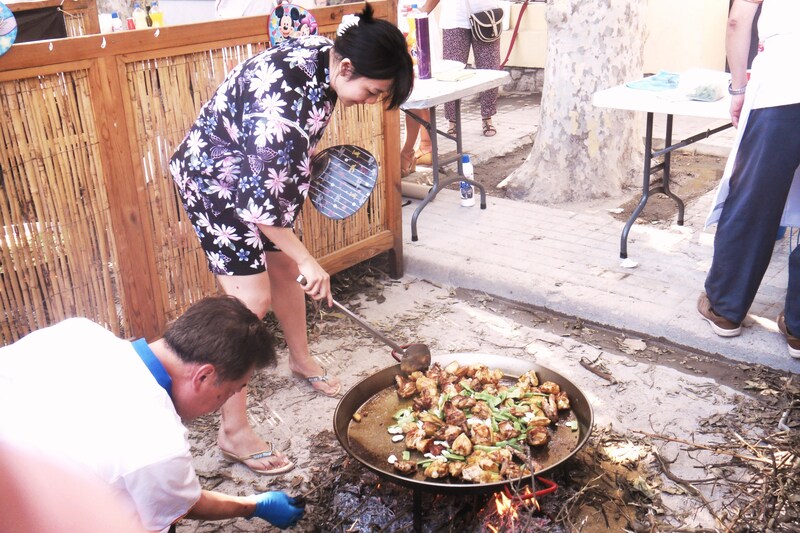 Edrick runs authentic paella demonstrations and Spanish cookery classes. First timer was Nick Blythe, the `Paella Fella´ who cooks authentic Valencian Paellas in Turners Hill, West Sussex, in England. He was cooking with his sons and freely admitted at the end that it was much harder than they thought it would be! Nick has been holidaying in the Sueca area for some years and has fallen in love with the area. The Japanese contingent came accompanied by the Consul, Mitsuyo Kajita, who was also a juror this year. Vale Paella and Tomoku Kawabuchi were also cooking here for the first time but Ginza Espero II had cooked last year and brought some colour and interesting utensils to the kitchen! Chambao from Miami is a fusion restaurant advertising a range of cooking influences and styles open all day and specialising in Cuban, Basque, Tapas and Seafood dishes. Restaurant Picasso from Hamburg may have had a bit of a shock when they received their ingredients. 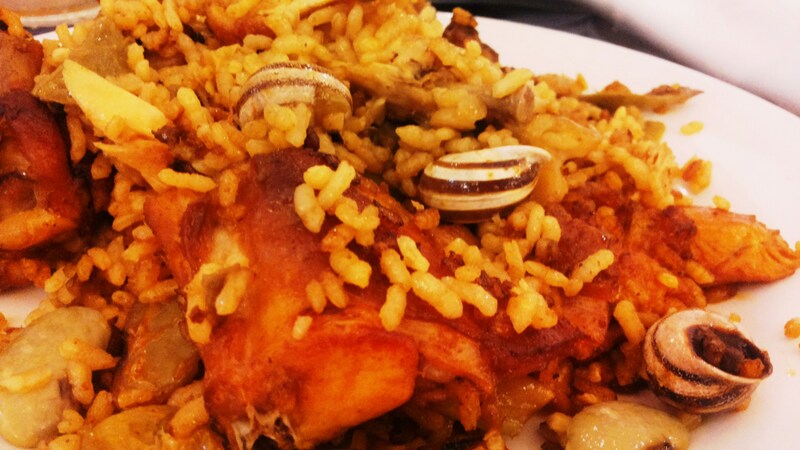 I see from their lunchtime menu on the website that their Paella Valenciana includes meat and fish! Colour in the Ginza kitchen! La Chaumiere certainly has some nice food on its website but there was no sign of a paella, just a black rice risotto with lobster! The Spanish entry to watch was of course El Redoli, home of Pepi Montero, a family restaurant on a bit of a roll at the moment having won the Alli Pebre competition in each of the last two years. So the cooking begins, the crowds gather at each of the kitchens and watch the efforts as they progress. 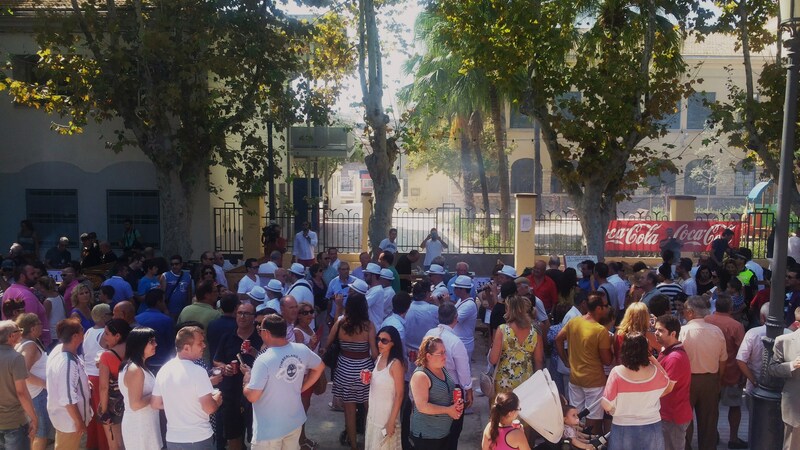 The crowd is entertained with free coco-cola and San Miguel from the sponsors…very welcome on a hot day and Tio Fredo, Valencia´s rock star belted out his homage to paella…a catchy little number! As the cooking progressed it quickly emerged that this year the paellas would be more similar than last year. Indeed the depth of rice, distribution of ingredients and the colour was indistinguishable as the paellas were finished and walked to the judges table. The judges were clearly going to have a hard job this year they and would have to rely on all the elements of their decision-making process….in addition to the symmetry and colour the taste, the degree of cooking of the rice and the `socarrat´ ( the caremelised bit on the bottom which is most sought after) . The rest of us went to the banqueting suite for a cold beer and anticipated the formal lunch and subsequent prize giving. When it comes to the awards the ceremony was split in two. Before lunch retired chefs from the area received certificates recognising their contribution and the judges a small sculpture recognising theirs. Amongst the judges was Guillermo Navarro from Wikipaella, recognising the contribution to the International Year of Valencian Paella that the organisation has made through social media to defending and promoting the dish. El Redoli, El Palmar, Valencia. Vale Paella , Tokio Japan. Second, Casa Picanterra, Cullera, Valencia. First, Posada Real de Santa Maria del Campo Rus, Cuenca, Spain. And so, another year was over. 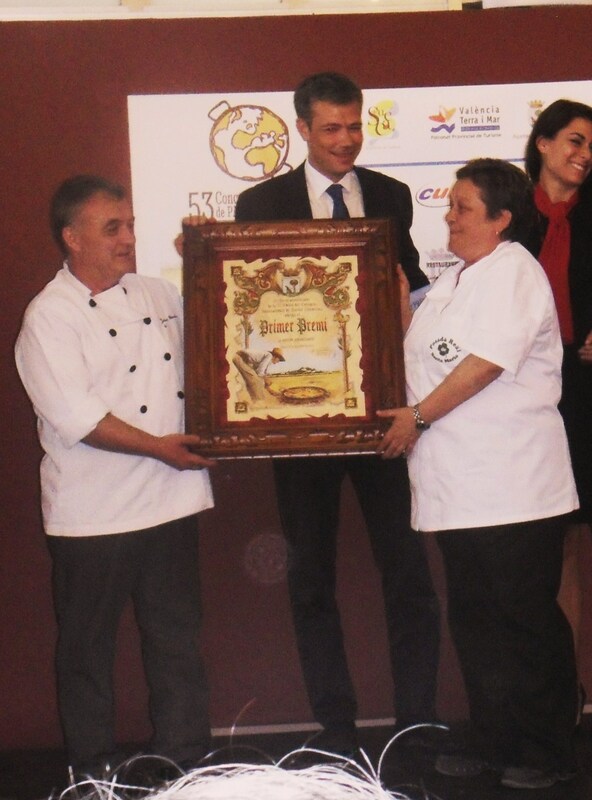 The organisers, principally Jesus Melero of Restaurant Ri Ra in Sueca had managed another triumph. Maybe one of the foreigners will win in 2014! 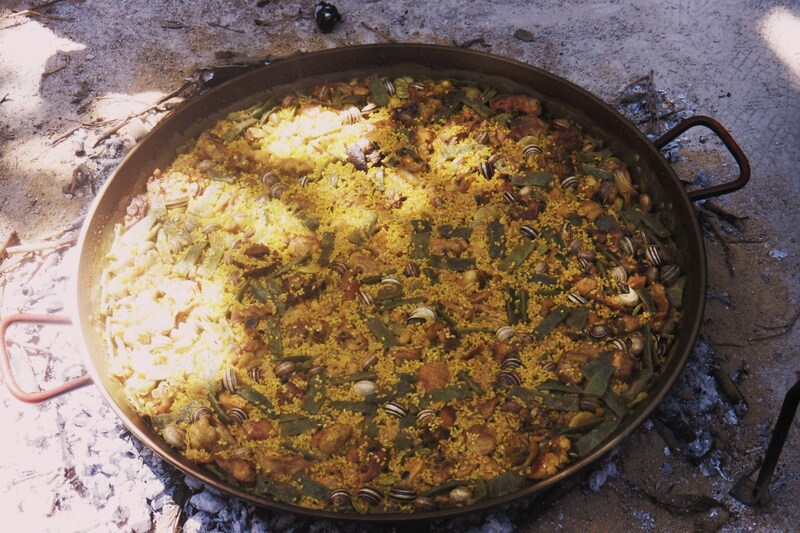 Paella Valencia. Best Paella in the World!